There comes a point where visuals dominate a film. You marvel at what is happening on screen, regardless of its place in the story. The Imaginarium of Dr. Parnassus has these moments, numerous ones actually. Rather famously, the film needed a replacement for it star Heath Ledger after his sudden death. Using the power of its visuals, and the unexplainable mind of Terry Gilliam, the answer to a star’s death is actually logical. The film focuses on a mysterious traveling act, where people enter into a mirror and experience their imagination in full. Where Ledger’s character Tony should be, another actor takes his place, explained away as this being someone else having a vision. Johnny Depp, Jude Law, and Colin Farrell step in perfectly (particularly Depp who mimics every movement of Ledger). Law is the recipient of a fantastical sequence on a ladder climbing into the sky, and then splitting in two. He then traverses the simple, storybook like land inside the magical mirror on a ladder that has become stilts, a fantastic, vivid visual. Oddly, much of Imaginarium takes place in modern day London, dim and unimaginative as it may be. The film here, despite Ledger’s energy, is not interesting. 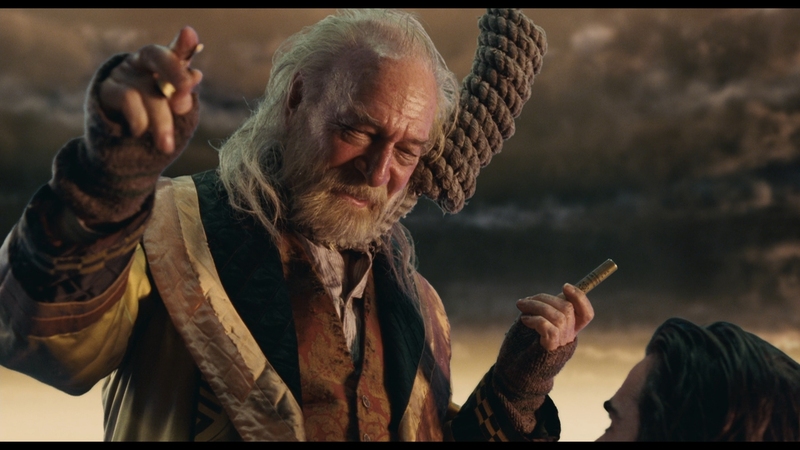 The central story, that of the troupe leader Parnassus (Christopher Plummer) making a deal with the Devil (Tom Waits) for Parnassus’ daughter in exchange for eternal life never feels tense or even interesting. Imaginarium feels like a series of glimpses into a bizarre world, one that will turn many away in terms of their goofy aesthetic. They are brief, yet the only interesting piece of the film. At times, they feel disconnected from the main story, and at two hours, are spread thin. One of the best occurs early, where a young video game player steps into his dream world, only to kill everything that moves despite its colorful, inviting atmosphere. It is an introduction, nothing more, yet satisfying unlike many of the later mirror scenes. If Imaginarium is anything, it is easily the best film to ever work around an actor’s death, putting forth some ingenuity to actually expand the mythology of the film while losing little in terms of the performance or impact. For his work in shaping the movie around tragic instances, Gilliam deserves credit. Unfortunately, as a whole, Imaginarium has no hook or pull. It seemingly exists to put the visuals that occur inside the director’s head on screen simply because of how bizarre they are, not because of their connection to a rich story. Sony’s AVC encode for Parnassus is tough to judge. Gilliam’s worlds are bizarre, so their creation undoubtedly requires the use of extensive digital work. 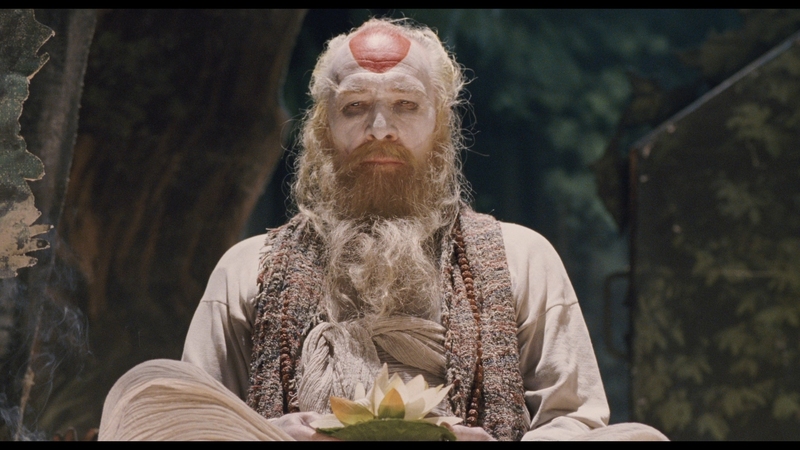 However, Parnassus was shot on film, and hardly a frame of this encode looks the part. Immediately standing out from the first shot of the horse drawn stage are the black levels, or at least where they should be. There is no depth to the frame, resulting in a flat, bland, and at times washed out images. Certain mirror scenes show marginally deep blacks, yet still not enough to fully realize dimensionality within the frame. Colors are then purposefully washed out. Flesh tones are pale, coming through as a shade of gray at times, and no, that is not part of the make-up during the stage shows. Even in the mirror worlds, colors seem limited and flat. Valentina’s final trip into the mirror, taking place on a boat with grassy fields surrounding it, lacks impact. The greens of the tall plant life are (ironically) lifeless. The sunset-like palette of the sky, made of oranges and yellows, lacks boldness or saturation. Part of that is the blown out highlights and blooming, yet even when a limited factor, colors are still washed out. Definition is generally poor. Low light scenarios offer limited opportunity, yet even close-up, high fidelity detail is at a premium. Patterns and designs of the costumes (nominated for an Oscar and rightfully so) are apparent, yet poorly delineated. At a distance, a processed, digital look dominates. This occurs even in non-special effect heavy scenes, where this look would almost be expected. Oddly, the latter produces some of the better close-ups of the film, such as Johnny Depp at 1:08:22. As Jude Law is stuck on the collapsing ladders, definition shows through as well. Grain is almost entirely absent for the full running time of the film. Occasionally a scene will appear where a minimalist grain structure will become clearly visible, yet these are so few, you could not be faulted for believing this was shot digitally. The faded look, terrible black levels, and pale flesh tones further make this encode appear non-film like, a true disappointment given the visual splendor that should be on display in these dream worlds. Thankfully, the audio side of this disc is capable of rendering the scale of these visuals when the video falters. Jude Law’s brief scene features stunningly deep bass as he stomps over the land on his improvised stilts. Splintering wood is spectacular in its clarity, and directionality even better as pieces go flying across the frame. Cannon fire during an action scene is fantastic, the shattering glass that accompanies a target hit sounding as clear as the wood. The surrounds are consistently engaged in the fantasy realms. Whether the film calls for deep echoes or general ambiance, this mix provides. Thunder and rain effects are aggressive and immersive, carrying superb directionality. A wonderful scene later has actress Lily Cole running through a black space as shattered glass passes by her. Motion tracking is fantastic, and the shattering sound effect so crisp, it creates an effect of being in the moment. Tony’s world literally becomes shattered near the end, causing a widespread panic as event attendees flee. Their screams move all around the soundfield, creating a frenzied feel to suit the on-screen action. Mixed in with the score and dialogue, the scene comes to life. The music bleeds into all five channels, while properly prioritized dialogue remains clear and precise. A solo Terry Gilliam commentary is followed in the menu selection by an introduction to the film that should be watched before viewing. Most of the features included here are brief snippets, such a single, lonesome deleted scene. Behind the Mirror is a three-minute look at the characters, far too brief to be of any value. Imagination of Terry Gilliam is a look inside the director’s head and his thought process that brought the film to the screen. Building the Monastery is a dissection of a major effects sequence, while a multi-angle featurette looks at the first trip into the mirror. Heath Ledger and Friends is six-minutes of praise for the actors who stepped in to take over the role of Tony after Ledger’s passing. A wardrobe test (with optional commentary) and radio interview, both with Ledger, are included as well. Doctor Parnassus Around the World looks at the various premieres, while a stage presentation shot in London was likely taken during a premiere as well. A selection of Gilliam’s artwork is included in a four-minute featurette, all rounded up by trailers and Sony’s usual BD-Live access (and MovieIQ).